Mandrake the Magician is a classic Columbia Pictures cliffhanger serial from 1939, starring Warren Hull in the title role. 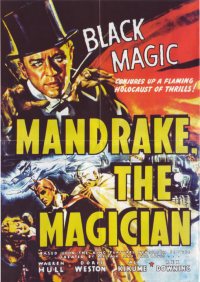 The serial is based on Lee Falk's comic strip "Mandrake the Magician". Mandrake and Lothar help Professor Houston (and his lovely daughter Betty) protect his radium energy machine from the head of an underworld gang, a sinister criminal genius known as "The Wasp". The Wasp will stop at nothing to steal the scientists invention. His evil machinations to obtain the device include blowing up a radio station, a power plant, and a dam. Fortunately, his dastardly deeds cause only minimal damage because of the timely intervention of the quick-witted Mandrake, who has vowed to stop The Wasp. Like most serials, the film had a relatively low budget. Storyboard drawings in watercolor by Glenn Cravath. Preliminary movie poster banner in watercolor by Glenn Cravath. The serial was released on a double-disc DVD by VCI Video in 2003. This page was last edited on 21 August 2016, at 18:33.